“I diversified from my family business of horticulture to fish farming in 2008 as the later has higher profits. 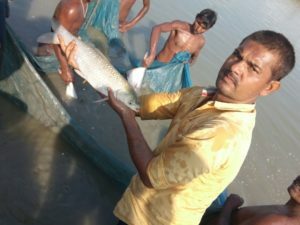 To do something new and different I started rearing pangasius fish in 2012 along with other regular fish breeds such as rohu, catla, mrigal, common carp etc. Pangasius fish was something new for the consumers in Bihar state but for its delicate texture and delicious flavor it gained popularity. In addition the growth rate of this fish is much faster than other fish breeds. As it grows fast and is sold at higher price it leads to gainful returns for the farmers. 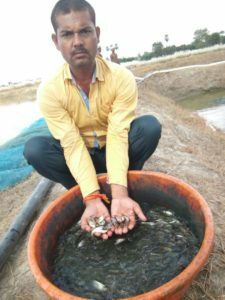 However due to the inferior quality of seed the production was never upto the mark therefore I started the hatchery in 2014 for producing pangasius fish seed,” describes Mr. Himanshu Kumar Singh, founder Gariakothi Matsya Lock Farm, the drive to produce fish seed. In the year 2017 he got the best results with 30,000 pangasius fish seed production and was able to sell the seed to other farmers. Throughout the seed production process, Mr. Himanshu received guidance and immense support from Dr. Tun Tun Singh, lecturer, Fisheries Training and Extension Centre, Mithapur, Bihar. Goriakothi Matsya Lock Farm is situated at Goriakothi village, Siwan district, Bihar. There are 14 fish ponds constructed in 15 acre farm area. 4 acre is utilized for fish farming while remaining 11 acre for exclusively used for fish seed production. The farm has 10 million capacity fish seed hatchery. Pangasius fish is commonly cultured in fresh water. It has dark grey coloured back and silver belly. It has more red blood cells and an additional respiratory organ that enables it to breathe through skin and bubbles. It can tolerate high temperature and less dissolved oxygen that is 0.3 ppm but highly sensitive to cold. Water pH must be 7 to 8is ideal for rearing this fish. It feeds on food that settled at the bottom of the pond as well as food while floats in water. It moves all around the pond and is harmonious to other fish breed as well. “In one hectare pond area we can rear 20,000 pangasius fish and in the same pond we can add 3,000 catla fish as well. Pangasius fish survives easily on plankton that is produced naturally in the pond,” he shares. As in any other reproduction system, even in fish superior quality of breeding stock plays a vital role. Healthy breeding stock leads to healthy offspring. Particularly in pangasius fish breed, for the best results in breeding the age of male and female fish must be 3 and 4 years respectively. “Female fish can be spawned several times. Fish having 1 kg weight yields 1 lakh eggs in one cycle out of which 15% survive. I got best result of 15% eggs’ survival in 2017 and feel this rate would definitely increase in 2018. With suitable feed and temperature control of pond water higher survival rate of eggs is achievable,” he asserts. The next-generation brood of pangasius fish is always 20% better than the breeding stock as experienced by fish farmer. Hatching period is from 27-32 hours after spawning at temperature of 28-31°C. The challenge faced in pangasius fish farming is living through winters, “This fish breed is prone to high mortality during colder times precisely from November-February. To cope with this problem in the pond we keep the temperature of water as 24-25 degree contrary to 5-6 degree in lake. To do so we run a pump set for 24 hours in the pond,” states Mr. Himanshu. 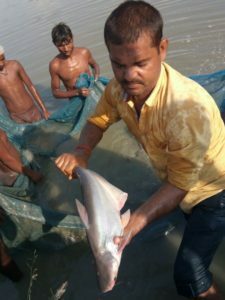 In future Mr. Himanshu plans to increase the production of pangasius fish seed to meet the seed demand of farmers from not only Siwan district but in across Bihar and other states. In addition he will soon produce the seed for Amure carp and Jayanti rohu fish which is relatively new fish varieties for consumers in the market. “I always want to do something new and different from the masses. The reason being it gives me a unique identity in the industry and the new learning process is always an enthusiastic journey. I shall be consistently working to improve pangasius fish seed production and at the same time introduce Amure carp and Jayanti rohu fish in Bihar. It is mandatory to think out of the box and try to be first to introduce something new in the market then success is assured,” he concludes.